PB Weir Electricals range of Earth Discharge Rods are used for the removal of electrostatic charge from disconnected circuits, prior to undertaking maintenance work. 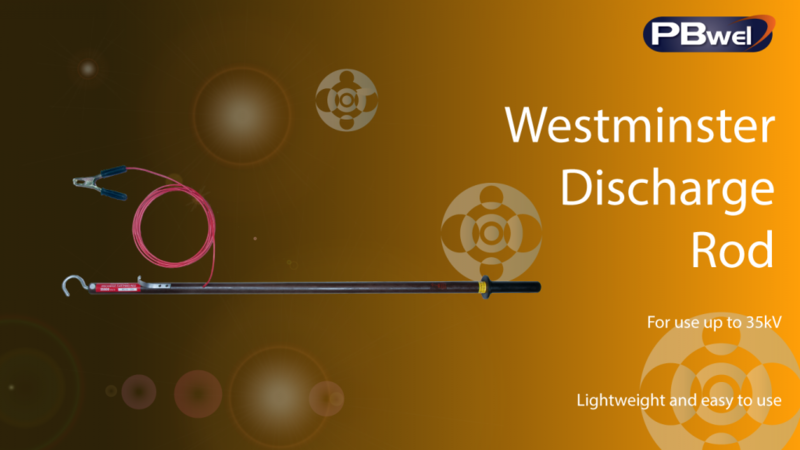 Manufactured from 1.2 metre-long lightweight insulating tubing and fitted with a discharge hook. The connection to earth is facilitated by a 4 metre-long earth cable with earthing (crocodile) clips. Models are available with a discharge limiting resistor for use upon capacitors. Before using the Earth Discharge Rod, the circuit should be tested using an appropriate voltage detector to verify that the circuit has been disconnected. These are also available from our Westminster Detector range. Ensure that the discharge rod that is to be used has an insulation level satisfactory for the circuit to be tested. These instructions should be read in conjunction with site safety instructions and PPE should be used in accordance with these. Ensure that all site safety procedures are observed for access, safe use and removal from site.